On these rainy days with heavy rainstorms, I always thinks of a cup of hot chocolate in my hands. Hot chocolate in its own glory is already a winning formula for me, but add with some marshmallows? Yummy!! This is my version of a hot chocolate with marshmallow, in cupcake form. 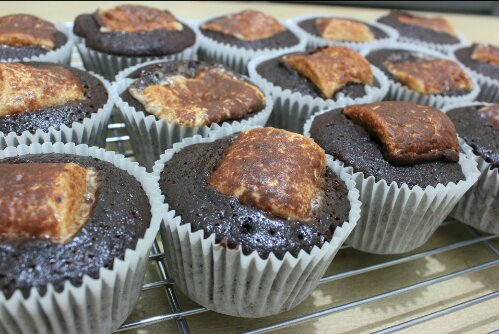 The recipe itself is just a basic chocolate cupcake added with marshmallows, it’s not rocket science. 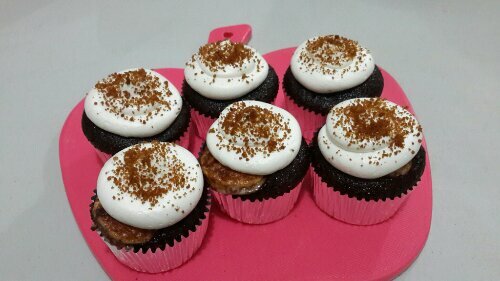 But I’m gonna share my favorite chocolate cupcake recipe with you. It’s perfect as cake also. 1. 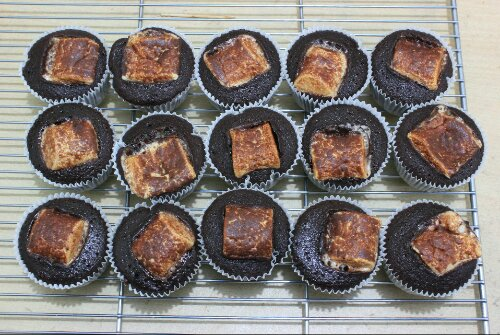 Preheat the oven to 150°C, line the cupcake pan with 12 cupcake cups, add a piece of marshmallow onto each cup. 2. Mix flour, cacao, salt, baking powder, baking soda in a bowl, set aside. 3. Put butter and sugar in a mixer bowl, beat in high until fluffy and pale. 4. Add the egg one by one, give 30 seconds between each addition. 5. Mix in high until smooth and pale in color, light yellowy. 6. Add the dry mix and milk alternately little by little untill they all mix well. 7. Scoop the batter onto each cup covering the marshmallow. In baking, the marshmallow will rise above the batter. 8. Bake for 18-20 minutes, or until the cake tester comes out with a bit crumbs in it. If it’s clean, the cupcakes are probably to dry. Now on this state, these cupcakes are already good to eat without frosting. If you want to add frosting, I recommend a simple tasting one, like vanilla butter cream. I add sprinkles of brown sugar on top of the frosting. Brown sugar tastes sooo good with chocolate.